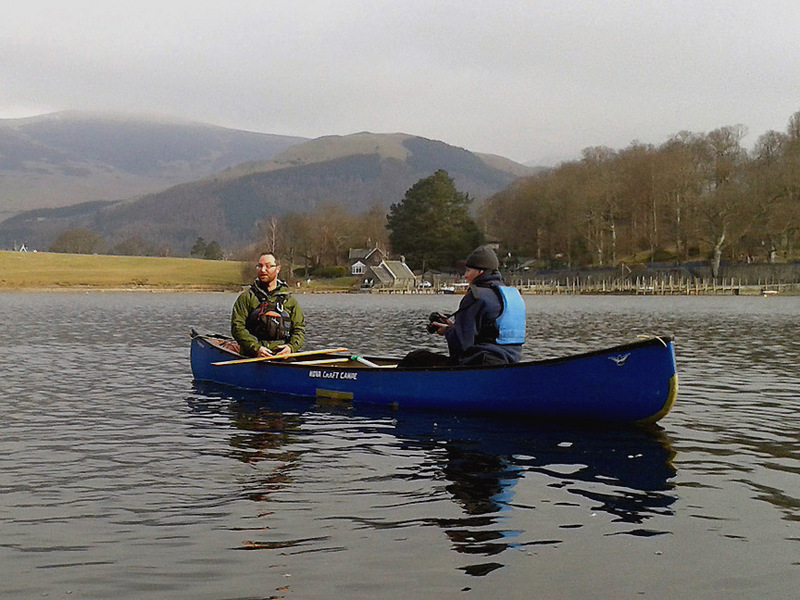 " A morning with Keswick Canoe and Bushcraft "
Date & start time: Monday 4th March 2013, 10.30 am start. 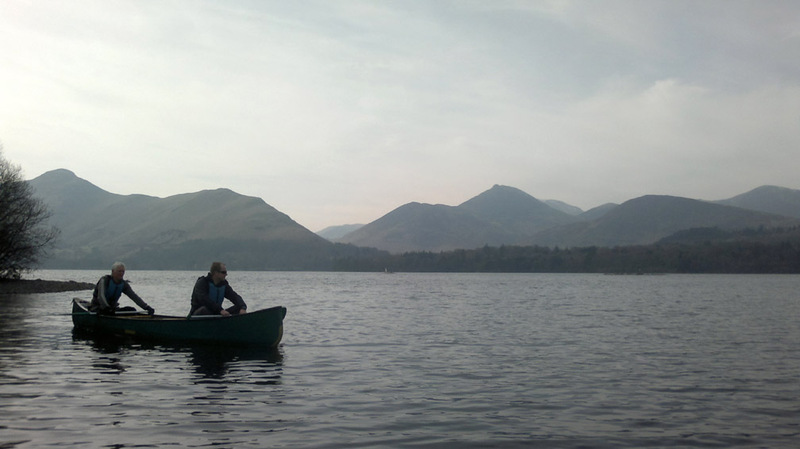 Places visited : Derwent Water, Derwent Isle (no landing) and Lord's Isle. Travel details : 1.25 miles, approx 2 hours. Highest point : Pretty well level this one ! Walked with : Paul, Claire Jeanie, Ann-louise (I hope that's correct !) Mark and photographer Gavin Woolard. Weather : Sunshine, a slight haze and a slight but cool breeze. 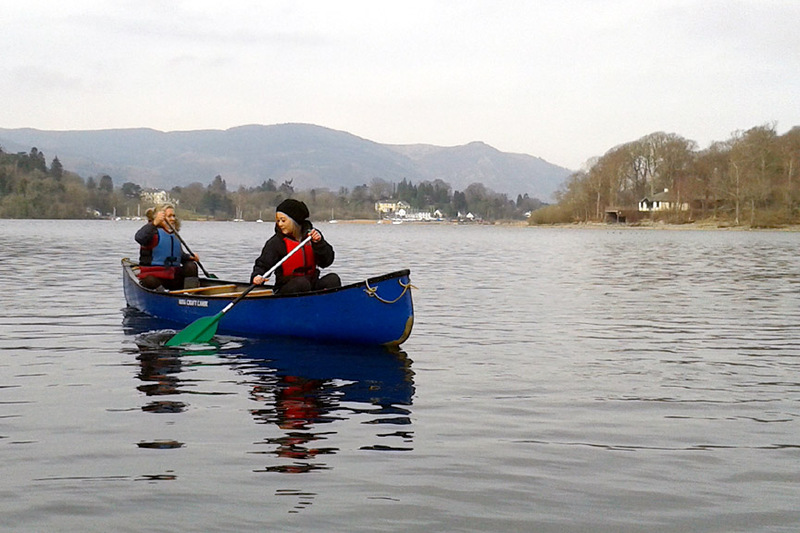 My colleague Claire has just left Fishers to work full-time with her husband Paul in their canoe company based here in Keswick. 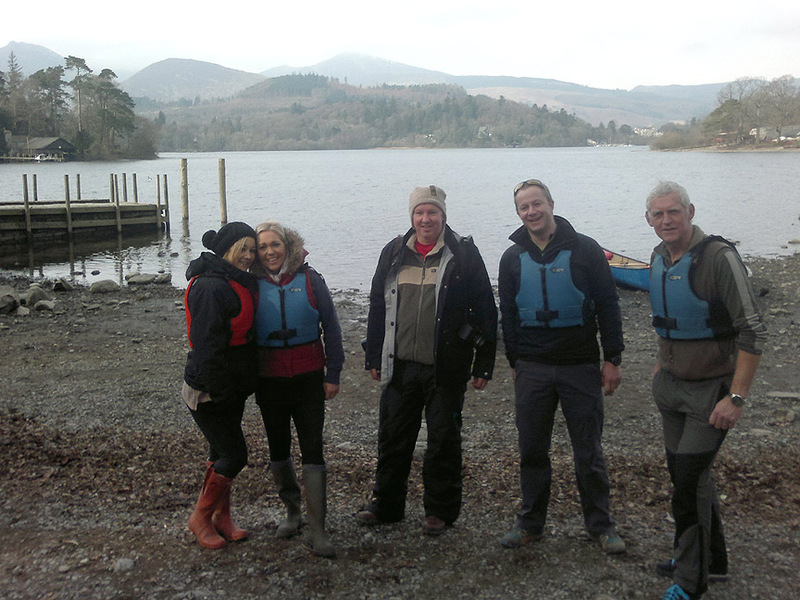 so volunteers were requested to paddle the boats. 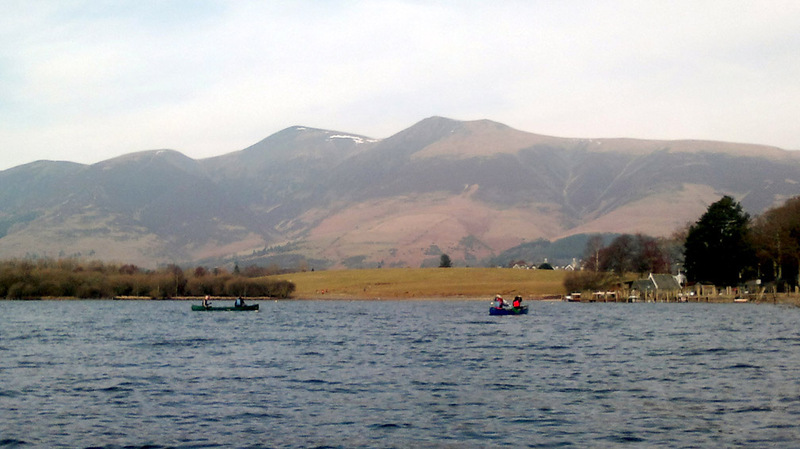 Did I want to spend a few hours on Derwent Water in the sunshine . . . didn't take long to decide that one ! 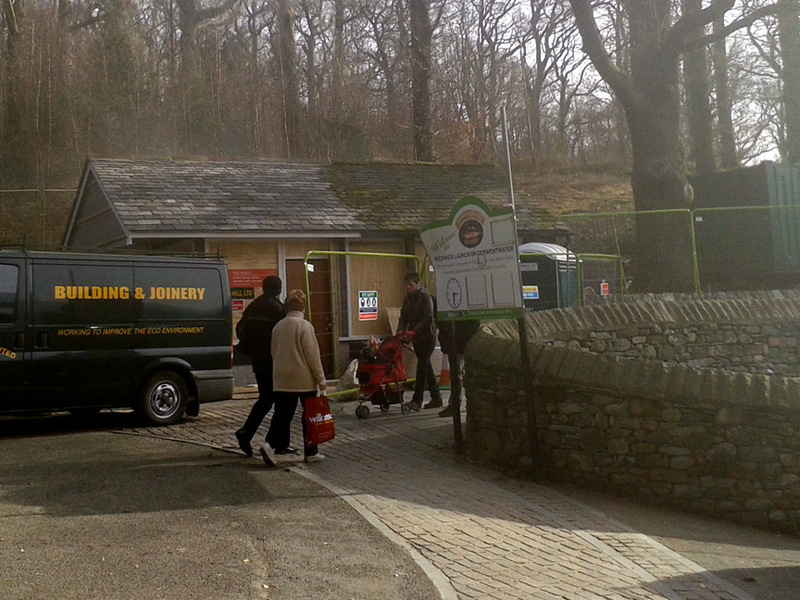 An odd one to start but this is the National Trust Shop at the Boat Landings being extended and renovated for the new season. 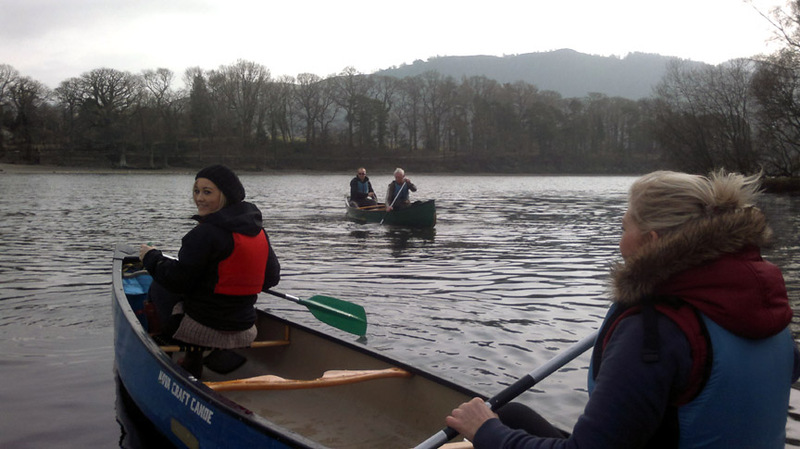 Keswick Canoe and Bushcraft have been offered the chance to share the building, along with the new, improved Trust shop. What a great start to their new season . . . a very visible presence with which they can really take their business forward. 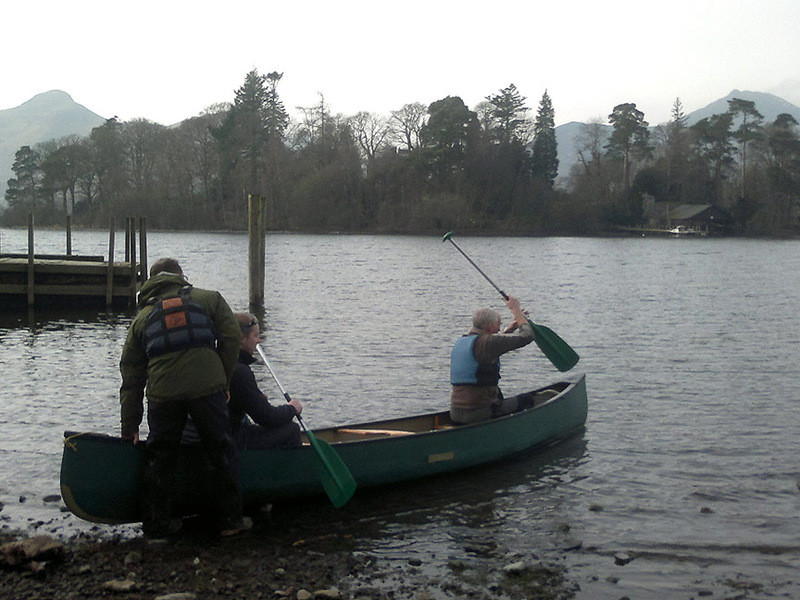 Today, we all met up at the Derwent Isle boathouse just after 10.30 am. Five eighths of today's crew . . .
Two friends of Claire's (Jeanie and Ann), Gavin from the camera club, my colleague Mark and myself. 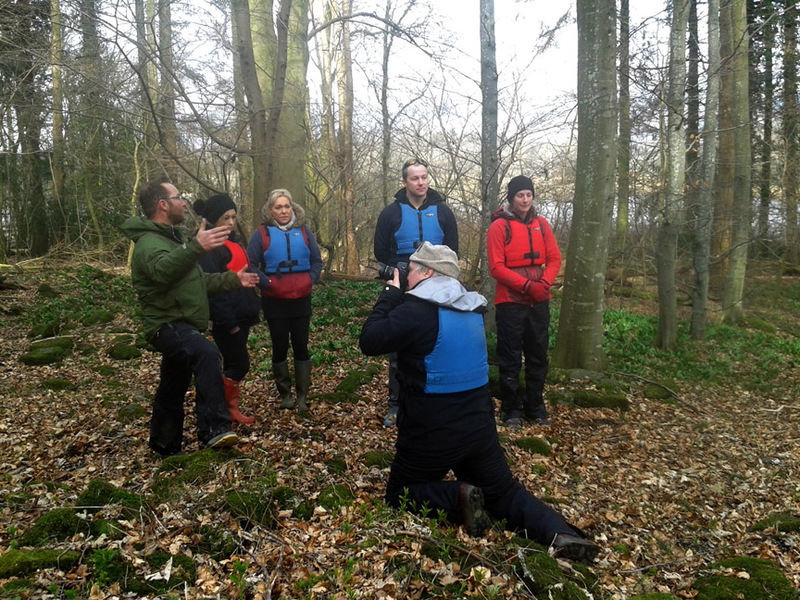 Paul, the real subject of today's outing, hands out safety gear and talks about his plans for the trip. 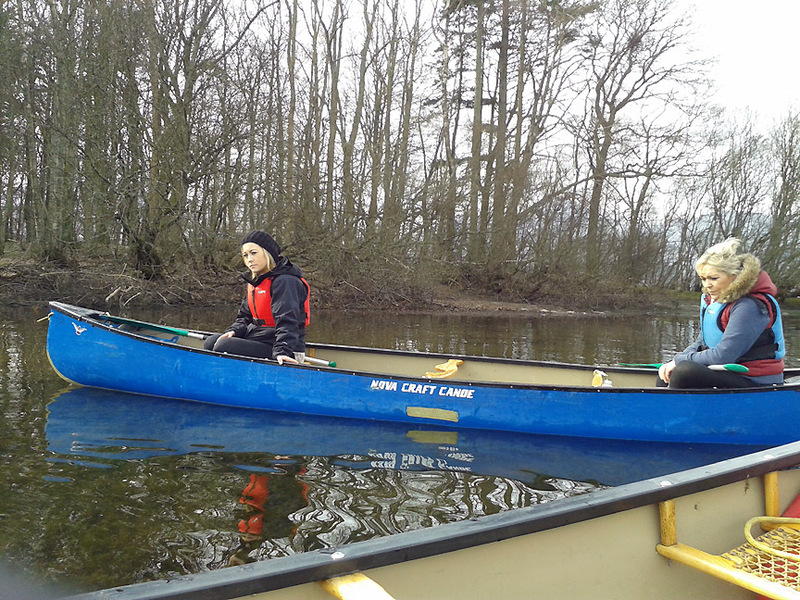 Mark and I set off in the first canoe. 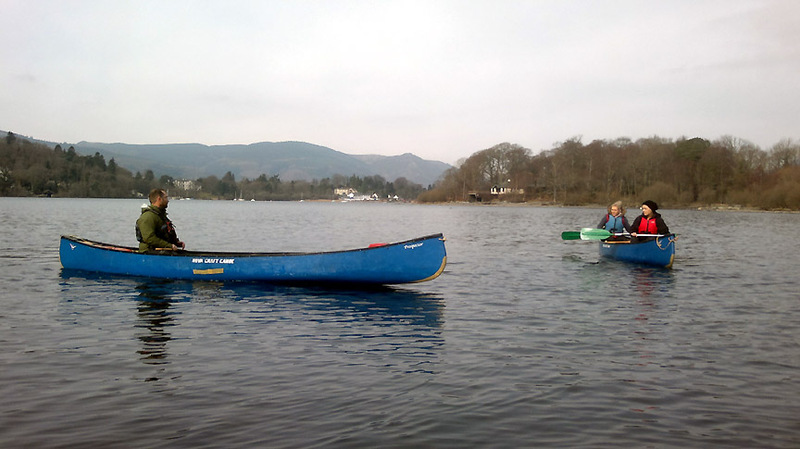 The girls take to the water in the second, their progress recorded from the jetty.
. . . finally we were followed by Claire and Paul in their boats. 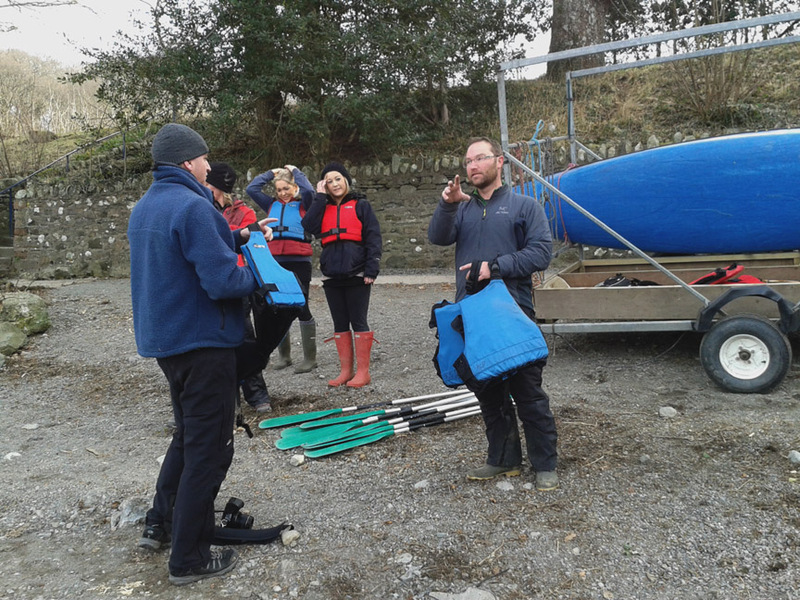 and we start with an introduction to the Canadian canoes and how to paddle them. 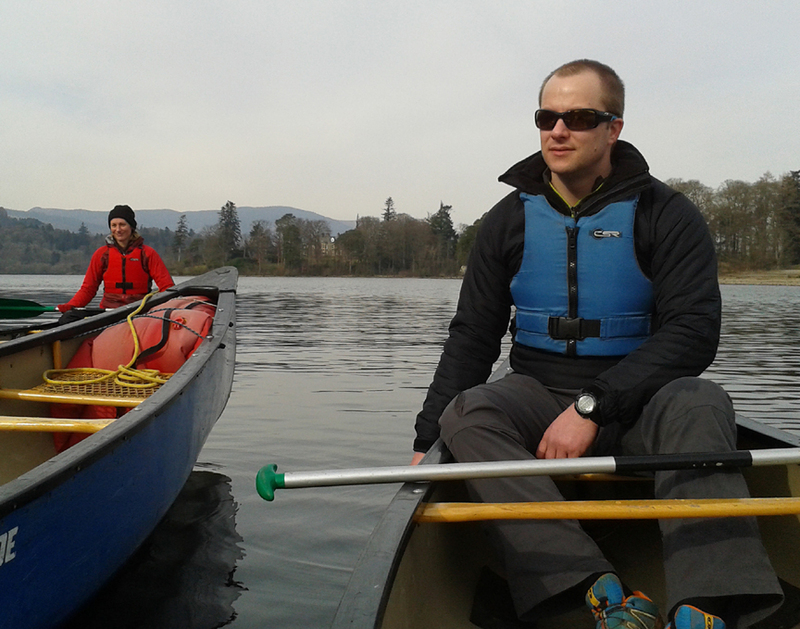 Paul offers advice as we make our way out to the sheltered waters around Derwent Island. 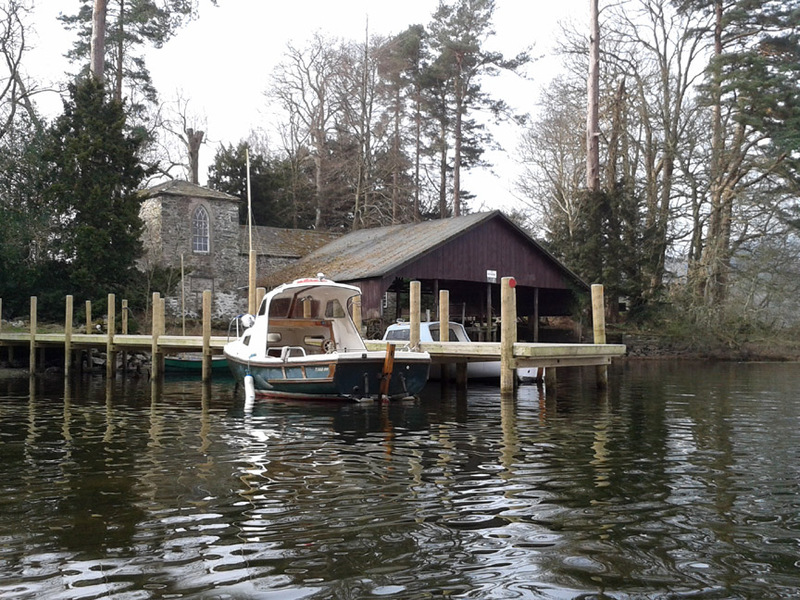 The jetty for the big house on Derwent Island itself. 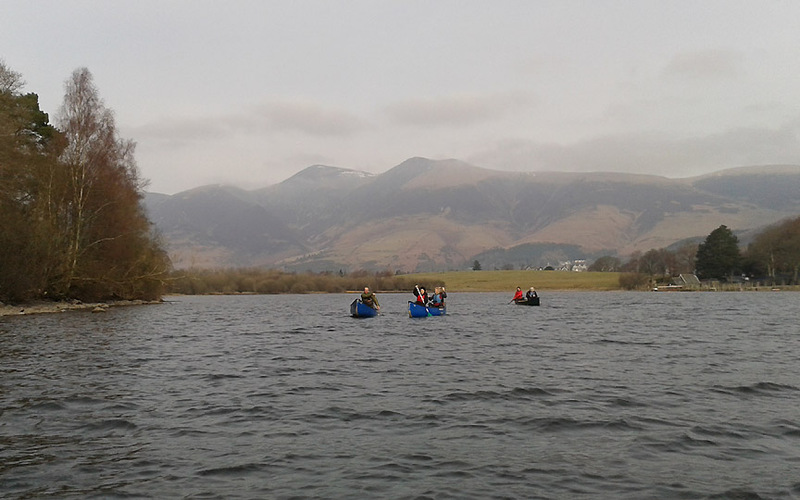 The island is owned by the National Trust but let privately so there is no landing. The Island and gardens are available to visit several times a year but only on specific "Open days". 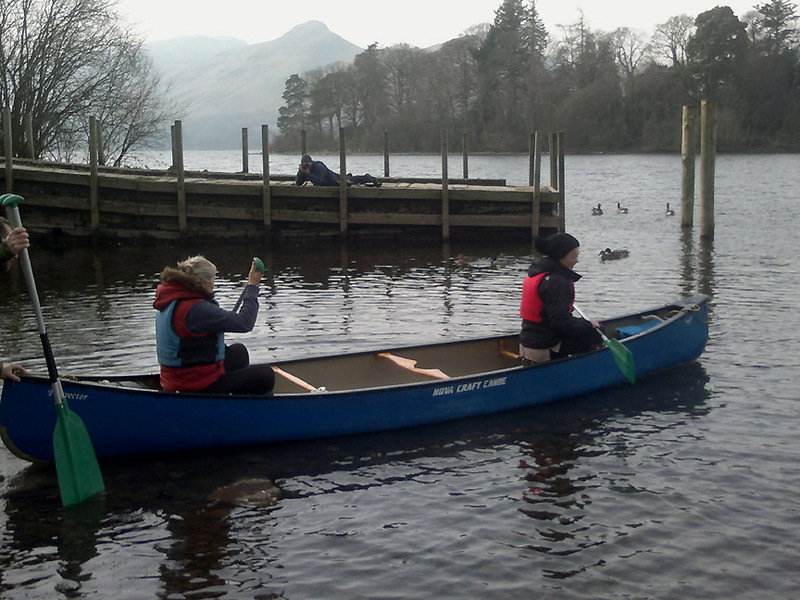 We practice slow turns, fast on the spot spins and manouvering the canoe sideways should it be needed. Sunny (check out the shades) but cold (check out the gloves) ! 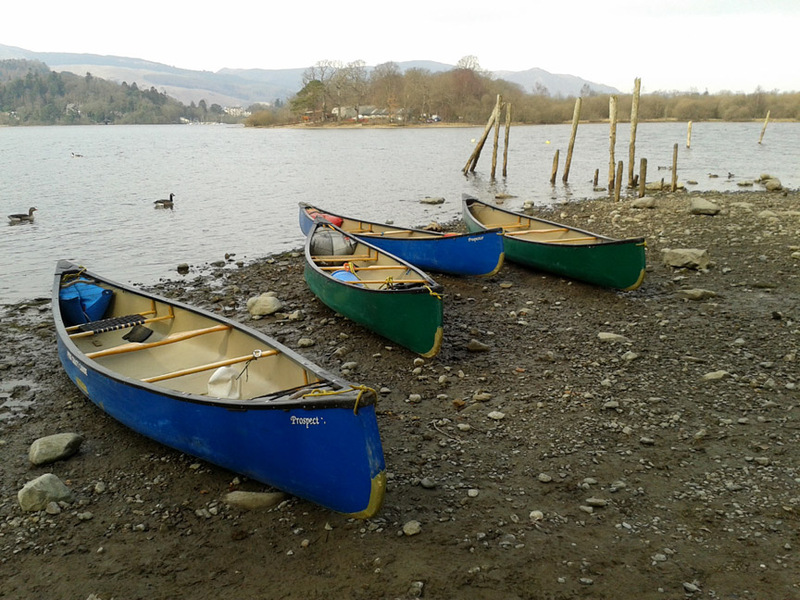 Time to venture out into the lake and leave the flat calm waters behind. 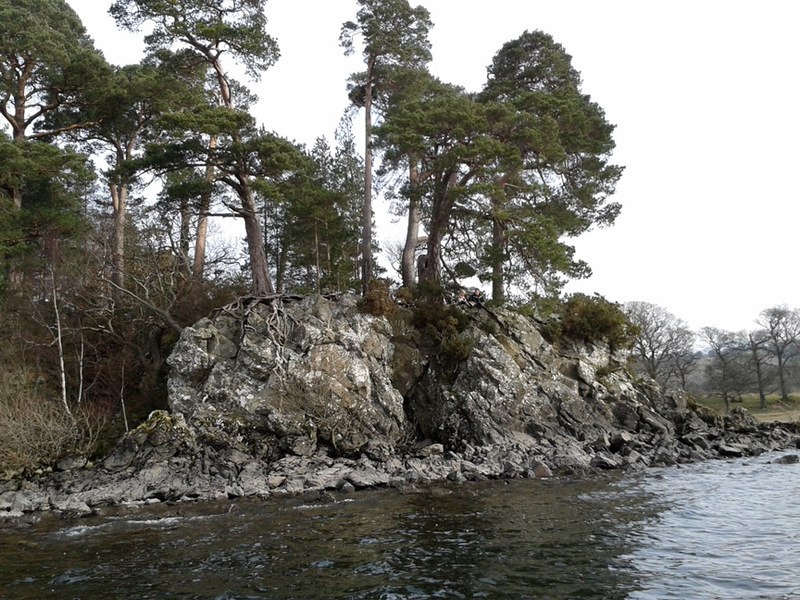 Friars Crag, often seen from the land, but seen today from the water. where Paul tells us of the history of this and many of the other islands on the lake. We listen as the history of Lord's Island is recalled. as he supported the wrong side in the Jacobite Rebellion of 1715. 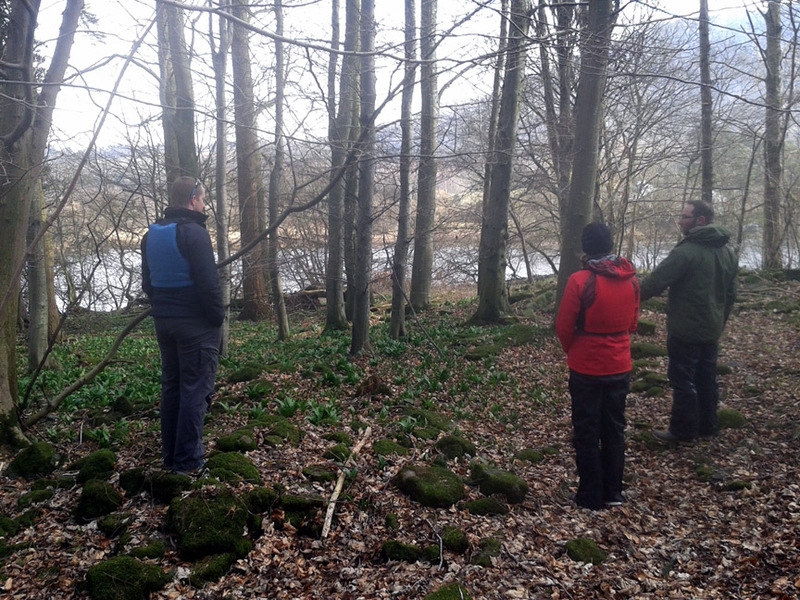 His wife escaped up a little known track onto Walla Crag . 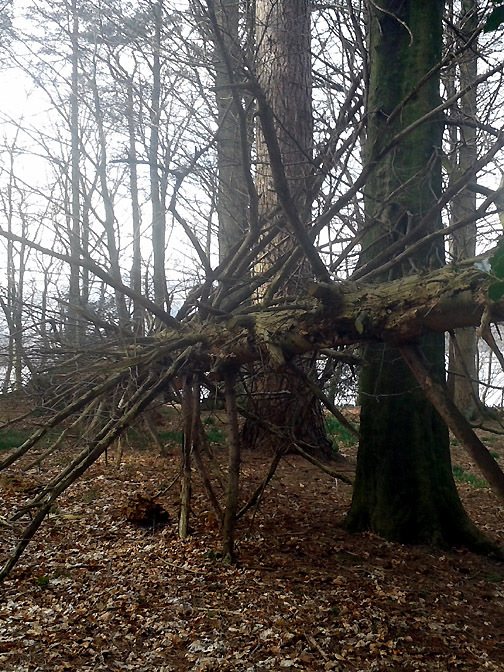 . . the area is still known to this day as "Lady's Rake". as it was a place of safety for stallions to stop them being stolen by the ancient raiders. and taking their jobs and their women ! Those German miners however, were the experts behind the Lakeland mining boom all those centuries ago. 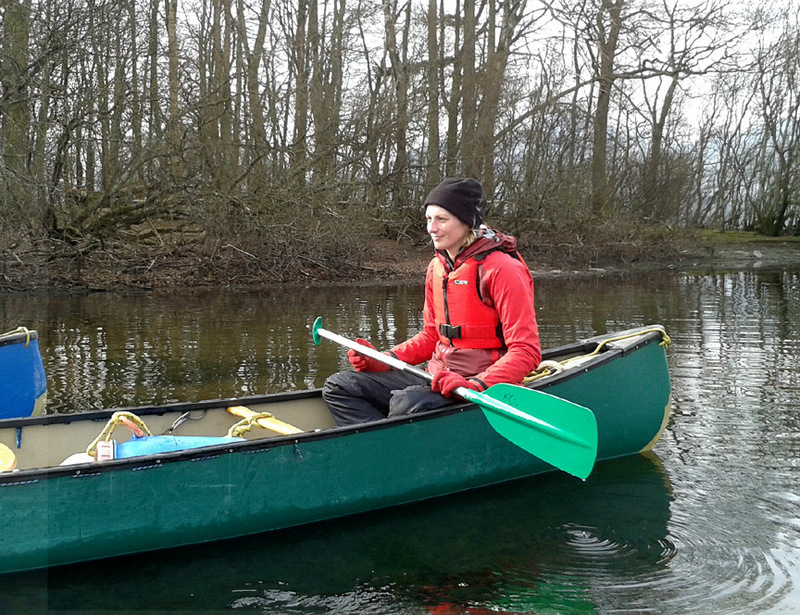 The most important canoe in the fleet . . . Sorry Claire, I was thinking about the coffee and biscuits in that barrel ! We landed on Lord's Island to look around . . . mind where you place your feet ! 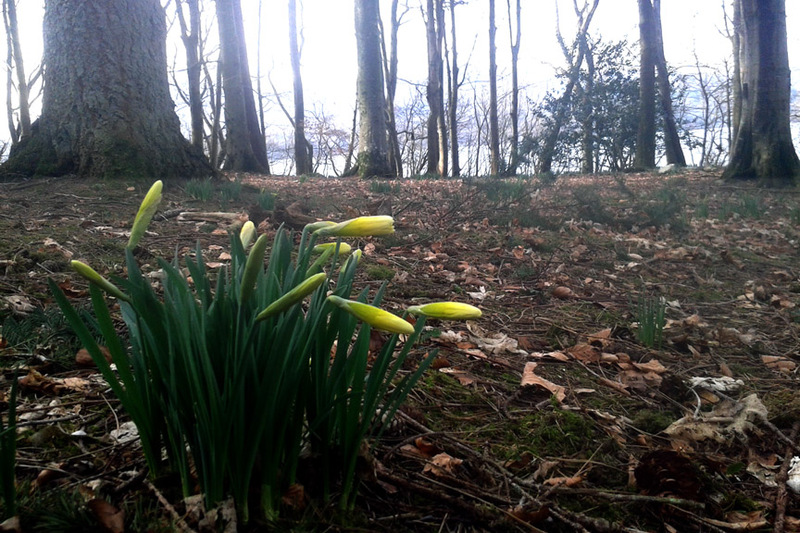 The new season Daffodils are just starting to bloom. 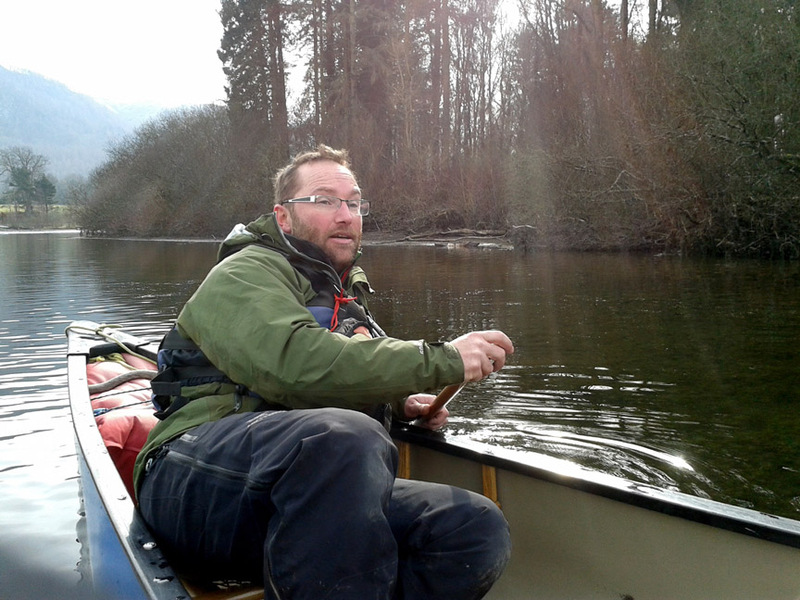 Paul adds bushcraft knowledge to his canoe skills and together he and Claire offer day and half-day canoe and bushcraft trips locally. 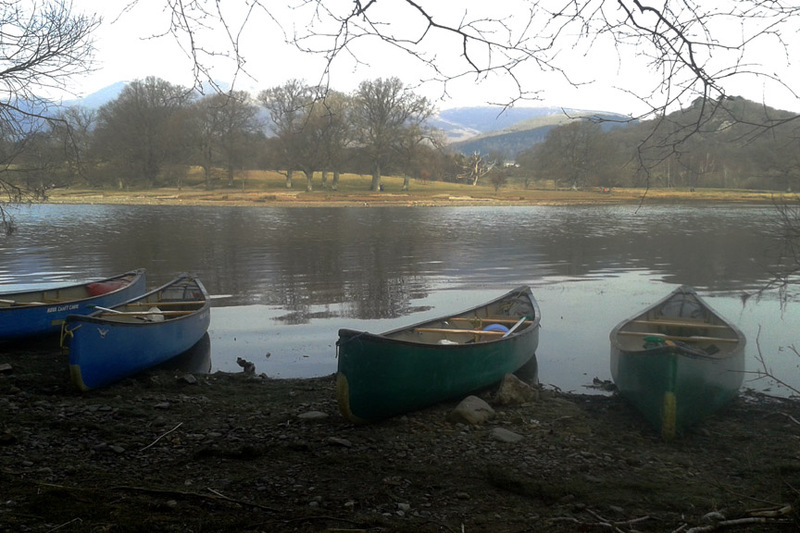 Multi-day outings further-a-field in other parts of the UK include full canoe-camping expeditions along many of the Scottish glens and rivers. On this section of the island the wild garlic is just starting to show. We take a sample leaf and enjoy the taste of its onion like flavour. 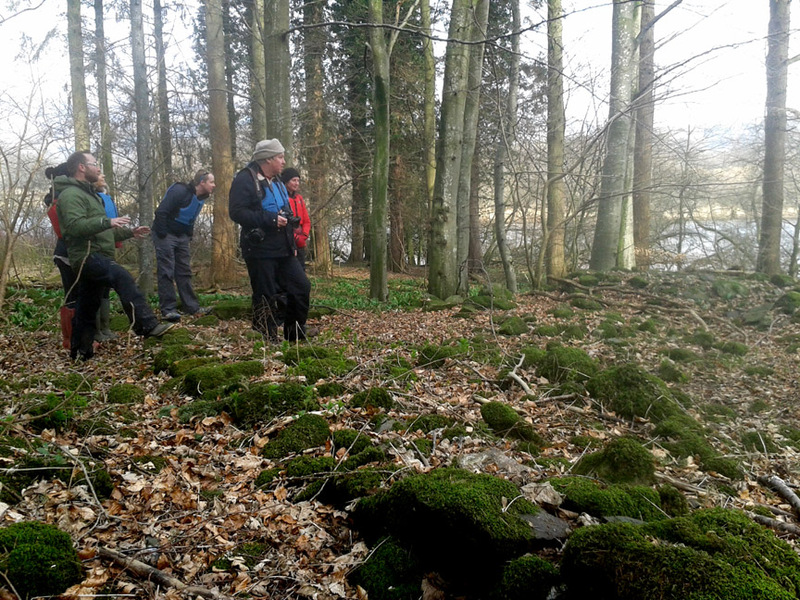 Hidden beneath the moss and undergrowth, the foundations of the old Manor House. 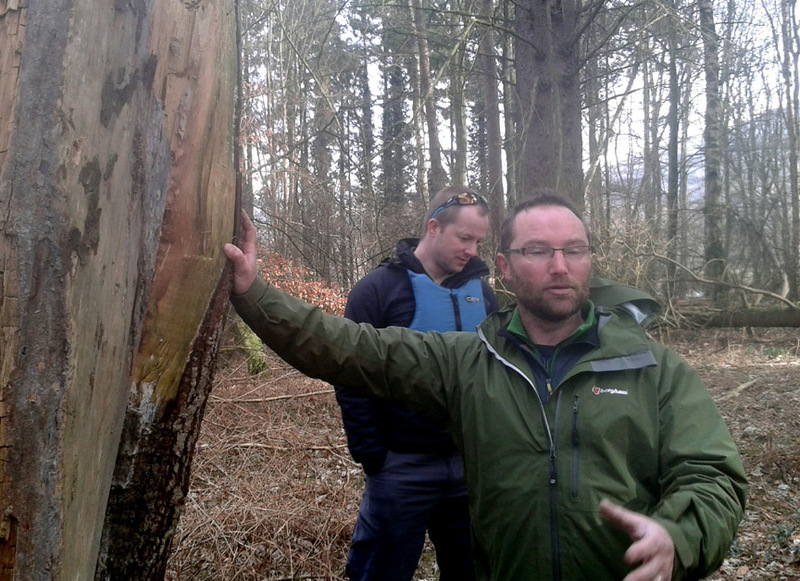 Paul also pointed out a feature called "The Butts" which was an old archery range, still visible as a long but rather overgrown 50 yard trench. At the time of the Manor House, all men and boys had to practice archery each week, in order to be proficient in the use of the English Long Bow. Had to take one of the photographer too ! I bet he had all his gear . . . I had forgotten mine . . . must be getting old ! 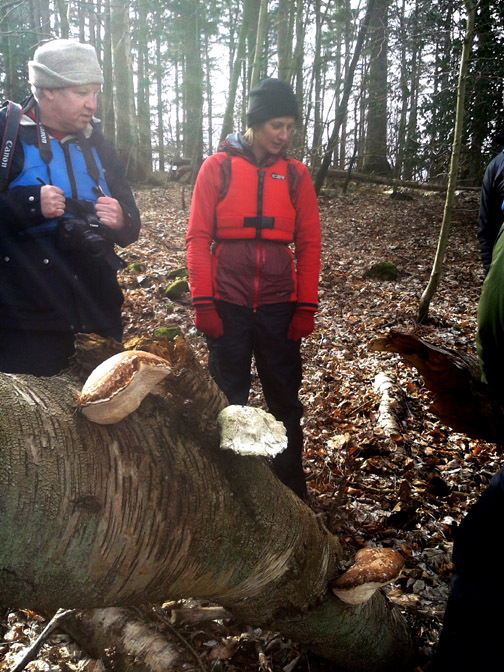 Bracket Fungus, practical but not for eating. 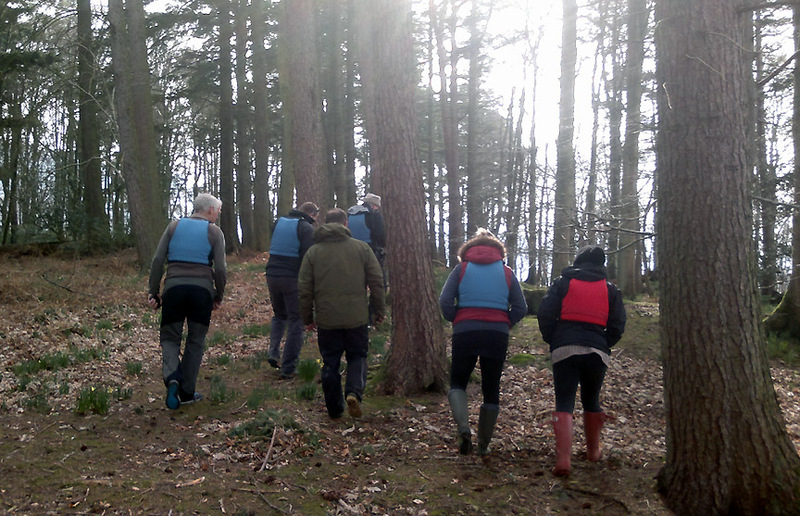 Back through the woods to the boats . . . mind your head. Ready and waiting for our return trip. It has been a great spell of weather . . . and today is no exception . 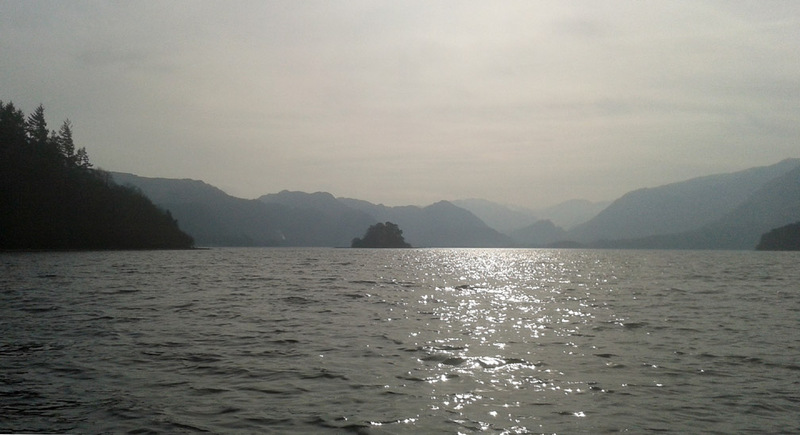 . . apart from that slight high pressure haze.
. . . normally seen from Friars Crag but viewed from the water today. 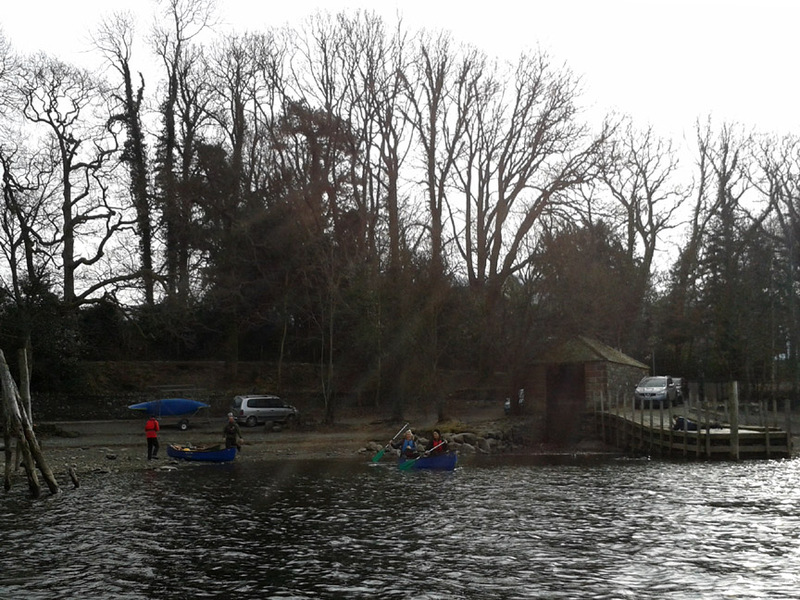 Returning to the Boat Landings. What a great morning out on the lake. 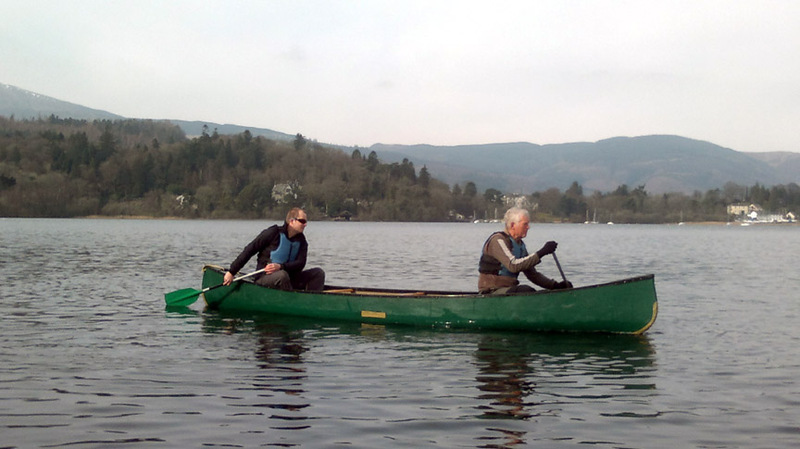 If you fancy a simple half-day trip or a more technical canoe expedition why not email Claire and Paul though this link. - families, couples, individuals and groups are all welcome " . . . and the coffee's not bad either ! This site best viewed with . . . the chance to do something different on a Monday morning.